Yesterday's announcement of Kung Fu Panda at USH got me thinking about the future of Shrek 4D in Orlando and how Comcast's purchase of Dreamworks will affect the park's future. In addition, since many people believed that Nintendo would be heading to USF, I believe it will be over in IOA to give parts of that park some revitalization. Shrek 4D gets replaced with Secret Life of Pets to complement Despicable Me next door. It will probably be a trackless dark ride on two stories like Transformers. Kidzone becomes DreamWorks Land with the following elements. playground or some kiddie flats. Nintendo will take over Toon Lagoon featuring a Mario Kart ride in the spot of the old theater, a Mario retheme of Popeye (Mario and Luigi save Peach from Bowser like Popeye saving Olive Oyl form Bluto) and a Legend of Zelda log flume retheme of Ripsaw Falls. I'm very much in favor of using that portfolio of Dreamworks and Nintendo IP along with the 475 acres of new land and buckets of Comcast money to do a third park. I think most of what you've proposed would work awesome, but you're saying add one new ride and re-theme two others for nintendo along with a re-theme of toon lagoons shops/dining. I think/hope Universal has wayyyy bigger plans for Nintendo. Nintendo is the next Potter for Universal. Eventually, I expect a Nintendo land in each UOR theme park. Robert is right. Nintendo is the next Potter. There are only 4 IPs that are "must see." Where exactly is Nintendo going to go in Orlando? Will it be the retheme of the KidZone or will it go to Islands. I hope it takes over Toon Lagoon since those rides are super dated. Nobody reads newspaper comics and kids don't even know half the characters in that land. Nintendo in each theme park? Depends if they can make it work. 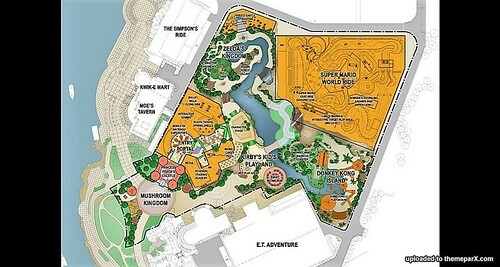 How about a lengthy Mario cart ride from Universal Studios to the new Third Gate Nintendo Land. Buy a park to park hopper. Nintendo land is going to replace the kid's zone at Universal. In addition to Kid's zone, there's also a patch of land that's between MIB and the Kid's Zone area that will give it some extra space. I don't know of any plans to immediately put Nintendo in IOA, but I'm sure they have something in mind. Anton, that would be a lengthy (ridiculous) ride with a couple of miles to the third gate. So if Nintendo spans multiple parks in Orlando and they use the kid zone of USF, the ride loads facing south in the back of that area. The track immediately enters a massive horizontal Warp Pipe (cue the sound effect) and goes down Backlot Drive. The track heads towards the USF entrance, entirely covered in the “pipe” as it collects hologram coins (ka-ching!) and Item Boxes suspended in air as they are in the game. The track shoots out of the other end of the Warp Pipe at the north end of the USF entrance before winding in and out of the famous archways of the entrance. The track swings by the Universal Globe before continuing down along the west side of City Walk Lake. The track elevates as it reaches the entrances to IoA, finding its way around the IoA lighthouse as it circles the tower 4 times before reaching the top and jutting out west over the lower end of City Walk Lake and Hollywood Way. The drawbridge drops just in time for the riders to cross into Bowser Castle. The pond just north of the Loews Royal Pacific parking lot has been transformed to a real lava pit with fire balls shooting straight into the air just like in Bowser's lair. As the track shoots out the east end of Bowser's Castle, riders find themselves at Universal Blvd. At this point, the track veers right as riders join live traffic southbound. After a couple of miles, the riders reach the property of the 3rd gate. The track enters a massive 750,000 sq. ft. show-building which contains the entire track of Mario Kart's Rainbow Road. Shrek 4-D may be rethemed, but not as Secret Life of Pets, as I don't think it is anywhere near as popular as neither Shrek or Despicable Me. The idea of a third park(fourth, if counting Volcano Bay) would be my bet. With Nintendo, this recent Dreamworks deal, and the new Fantastic Beasts films, there are many possibilities for a new park. Of course, that woudn't be any time soon. It looks as though Nintendo is definitely going into USF.